The young athletes of Nene Valley Harriers had a great weekend at the England Athletics National Championships for under 15, under 17 and under 20. Nine athletes were due to compete in Sheffield over the weekend of 28 February and 1 March 2015. Here's Ken's report. The young athletes of Nene Valley Harriers had a great weekend at the England Athletics National Championships for under 15, under 17 and under 20. Nine athletes were due to compete in Sheffield over the weekend of 28 February and 1 March 2015. 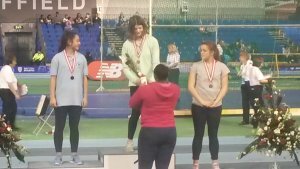 The highlight was Lincolnshire based athlete, Hannah Molyneaux who won the under 15 girls shot putt title to add to her first Northern title (see photo below). Hannh's family moved to the area recently after Geoff Capes agreed that he would coach their daughter. This is a young club athlete who has the ability and attitude to go far. Although her putt of 12.69m was not one of her best throws this year but it was still technically good and sufficient distance to win the title. Over the weekend, the club had four athletes make the semi-finals, three indoor club records were broken, 4 indoor personal bests and 2 all time best performances demonstrated that the club is surely in safe hands for the future. In the under 20 men's 400m heats, Ash Sandall and Ollie Dilloway qualified for the semi-finals in second and third place respectively for their heats with times of 49.38 and 51.63. Ollie's time in that heat was an all time fastest time for him. In the semi-finals they were drawn against each other with a very tough qualifying requirement of the winner plus fastest losers. Ash's semi-final third place performance of 49.7 was just insufficient as he missed out on the final by just one place after he left it too late to get into a qualifying place. Ollie felt his performance in the heats and finished fifth in the same race with a time of 51.8 after tiring in the later stages. James McCrae was in the under 20 men's 1,500m final and despite being in the leading group for the first half of the race was left when the eventual winner took the lead and picked up the pace with 600m to go. James dug in deep and dipped under the four minute mark for the first time in his career. His time of 3:59.91 is a club indoor record and a big step in the young mans career. In the 60m heats, club records seemed to be the target of the day with Nathan Pickering running 7.71s in the under 15 boys to break the club record and qualify by rights for the semi-final in third place. An hour later, in the under 20 heats, Kane Wright then repeated the feat by winning his heat, literally from the gun coming out of the blocks far quicker than his competition and running a club record of 6.94s. Unfortunately it was Kane's start in the semi-final which lead to him just running it in after getting it totally wrong. Nathan also glided over the line after being in the reckoning at the forty metre mark his strength failed him and he just ran it in. In his own words the training he has been doing as a member of the Leicester City Junior Elite Squad is not as tough as the training he would have been doing with NVH. Despite easing off he did run a time of 7.78s which was annoying as he realised he could have smashed his best time. Jasmine Allen competed in the under 15 girls 200m heats on Sunday, an event which saw all but two of the qualifiers for the semi-finals run times which would have individually qualified for the under 17 ladies semi-final. Jas was in a tough heat with three previous medal winners including the winner of the 60m on Saturday. Jas was disappointed to finish fourth but that turned into a smile when she found out that she had run an indoor club record time of 27.25s. Emma Hornsby competed in the under 20 ladies long jump and recorded a distance of 5.32m. Unfortunately she has been out of practice for this event over the winter and just started to get into form when her jumps came to an end. A good weekend for the youngsters and suggesting a positive outlook for when the league matches start in April.